Klamath Northern #207 rolls a freight south from Gilchrist. John Henderson photo, Jeff Moore collection. The Gilchrist family launched their family lumber company in 1880 in Drummond, Wisconsin. The company ran out of timber in Wisconsin within a few years and moved their operations south to Mississippi. The company could see that it would run out of timber in the south in the near future, and around the turn of the century that company started acquiring timber in central Oregon. The company later formed a subsidiary named Chinook Lumber Company to manage the Oregon holdings. Despite stiff competition from Shevlin-Hixon and Brooks-Scanlon the company eventually accumulated 85,000 acres of timber. In 1925 the family incorporated the Gilchrist Timber Company in Oregon to build and operate a sawmill. The generally slow times in the timber industry through the late 1920's followed by the Great Depression prevented the move to Oregon from happening until 1937. Gilchrist Timber had long since chosen its sawmill site, and construction began as soon as the decision to move had been made. The plans included an eleven mile long railroad to connect the new sawmill and town with the nearest point on the Southern Pacific. 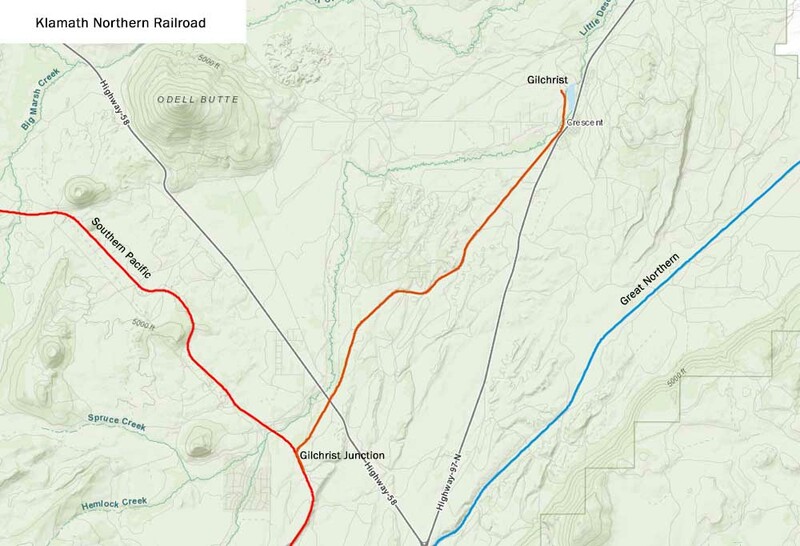 The company could have reached the Great Northern line with half the construction, but apparently a GN decision not to re-route their mainline south of Bend so that it would pass through the proposed site of Gilchrist back in 1926 cost that railroad any chance of getting any traffic from the Gilchrist mill. The company completed the railroad in 1938. The sawmill opened a short time later. 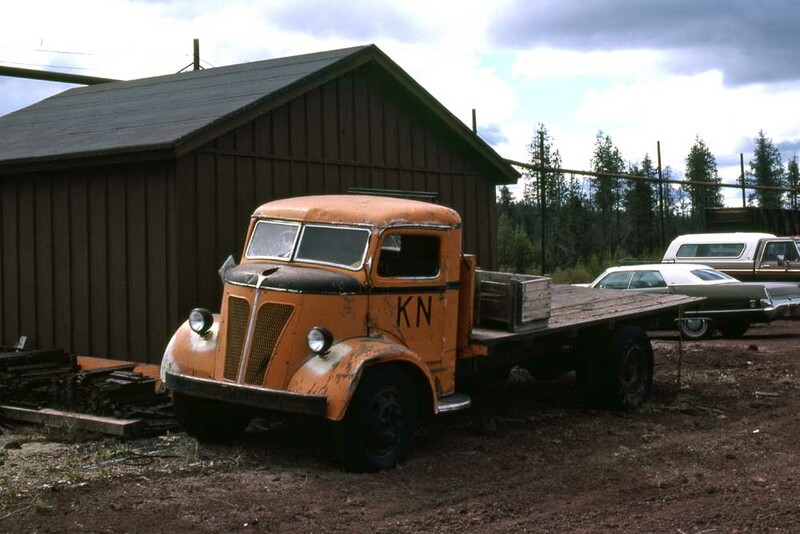 In 1940 the Gilchrist family incorporated the Klamath Northern as a common carrier to take over operations of the railroad. The Klamath Northern carried out an uncomplicated existence through the years. The railroad operated only one steam locomotive, a Baldwin 2-6-2 moved west from Mississippi. In 1955 the company purchased a GE 70-ton diesel to replace the steam locomotive, which the company scrapped at the Gilchrist mill. In 1965 the railroad gained a second customer in the form of Glaineville Box Company, which opened a large sawmill two miles south of Gilchrist. Glaineville Box closed in 1977. A leased Rick Franklin Corp. GE diesel resting in the Gilchrist engine house in 2004. Rob Jacox photo, used with permission. In early 1990 the Gilchrist family came to a crossroads. They commissioned an appraisal of the Gilchrist properties to evaluate future alternatives. In the end the family decided to sell out, and Crown Pacific Corporation took over. 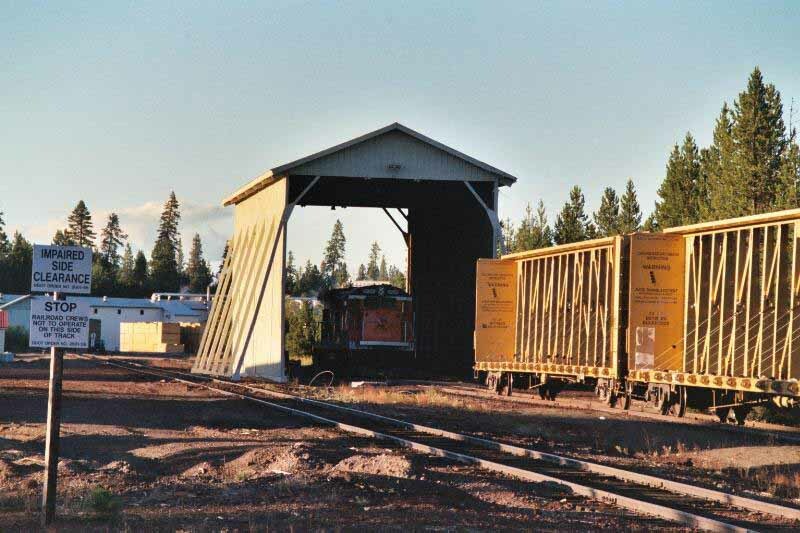 Crown Pacific continued sawmill operations but elected to close the Klamath Northern. The railroad lay quiet from 1991-1993, but an increasingly tight domestic log supply caused Crown Pacific to look oversees. Crown obtained a supply of logs from New Zealand, which soon started showing up in the port of Coos Bay. At Coos Bay the logs were re-loaded onto rail cars for delivery to the Gilchrist mill. 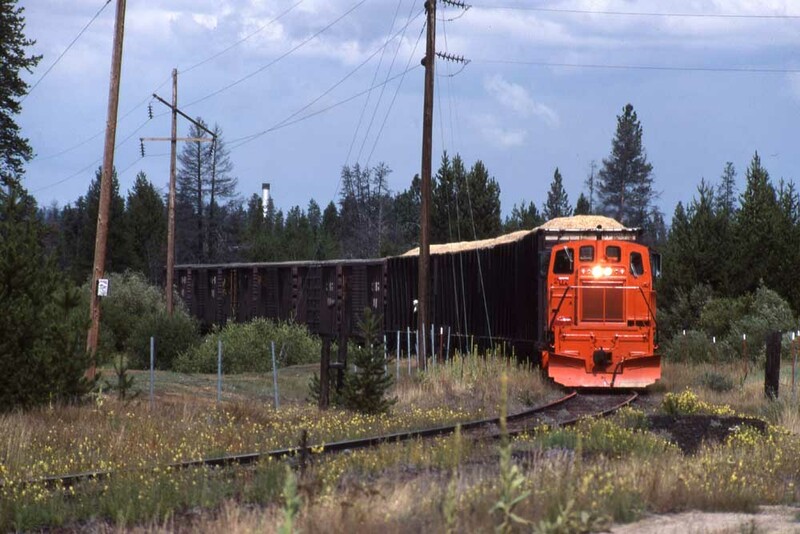 The company reactivated the Klamath Northern in 1993 as a private railroad under the name Crown Pacific Railroad, Inc. Crown Pacific Railroad, Inc. lasted until March 1994, when the company changed its name back to Klamath Northern and the line became a common carrier again. The railroad soon started handling outbound lumber and woodchips in addition to the inbound log traffic. The Klamath Northern continues in operation today. The log traffic has disappeared, but the lumber and woodchip business still warrants one and sometimes two round trips each day. Crown Pacific entered bankruptcy protection, and in late 2004 International Forest Products bought the company out. The new ownership has had little effect on the railroad to date. An old flatbed truck belonging to the railroad. John Henderson photo, Jeff Moore collection. The Klamath Northern is in Red. #204- Baldwin 2-6-2, c/n 33238, blt 1901. Built as Gilchrist-Fordney Lumber Co. #204; transferred to Gilchrist Timber/Klamath Northern #204. Scrapped 1955, with tender converted into snowplow. #205- General Electric 70-ton, 600-horsepower diesel electric, c/n 32304, built 6/1955. Purchased new. Sold to Modesto & Empire Traction #609 11/1990. #206- Baldwin 40-ton, 275-horsepower diesel electric, c/n 40755, blt 2/54. Apparently built as Long-Bell #401; to International Paper #224. Sold to Klamath Northern sometime during the 1970's. Retired 1983 and donated to California State Railroad Museum, where it is on display today. #207- General Electric 125-ton, 1,000-horsepower diesel electric, c/n 41290, blt 12/1982. Purchased new. Stored at Gilchrist 1991-1993. Currently in service. "Railroad Logging in the Klamath Country" by Jack Bowden, Oso, 2004. "Main Streets of the Northwest: Rails from the Rockies to the Pacific". T.O. Repp, Trans-Anglo Books, 1989. "American Shortline Railway Guide- 2nd Edition". Edward A. Lewis, The Baggage Car, 1978. "American Shortline Railway Guide". Edward A. Lewis, 3rd Edition (1986); 4th Edition (1991); 5th Edition (1997); Kalmbach. "Tough Times in Timber Country" by Greg Brown, November 1990 Pacific RailNews (Issue #324): Pgs 24-34.